I received an ARC copy of this book from the publisher in exchange for an honest review. Bless the Stars for Skyward. Brandon Sanderson’s newest epic is released with as much fanfair as his others, a 528 page beauty of space flight and growing up to show you’re the best, against all odds. Spensa is a great little character with some serious attitude. As a young girl, she is enamoured by her father – a spacefighter pilot for the DDF – and as any Daddy’s Girl she looks up to her father and wants to do what he does. Events that follow change Spensa’s life for good and here is where our heroine starts to come into herself. As always Brandon’s work is brilliantly written with characters you love to love and characters that you love to hate. With protagonist’s and antagonist’s galore, you’re sucked into Spensa’s world from the get go; from the astoundingly descriptive local areas to the deadly Krell and their mission to destroy. 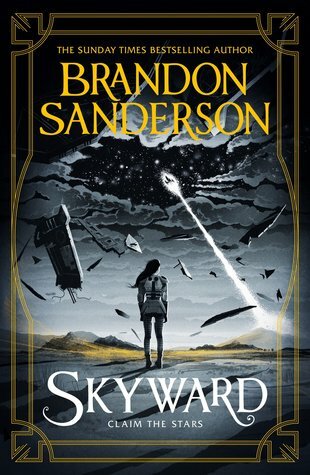 Skyward is Brandon’s latest Young Adult fiction novel – and as a non-Young Adult reader I can 200% say read this book! Skyward has Brandon’s usual flair for the epic with humour in spades – I love M-Bot. The characters in Skyward are a toss up between great and awesome. Certain characters have got a nice way of saying something without saying anything at all which is something I’ve always loved in a good book. I think my favourite other than Spensa and M-Bot has got to be Nedd – you’ll see why when you read the book, he’s the good guy. Skyward has it’s humour and it’s drama but it also has it’s sadness. My eyes did well up at several parts and you know a book is good when it brings emotion to the forefront. When you sit there reading and you instantly feel a connection with the characters and the surroundings and you find yourself rooting for your favourites. I would highly recommend Skyward to anyone who loves sci-fi, young adult and a mix of the two. Another great book by Brandon Sanderson and I can’t wait to see where the story goes from here.